The eight Millennium Development Goals (MDGs) – which range from halving extreme poverty to halting the spread of HIV/AIDS and providing universal primary education – have been a milestone in global and national development efforts. The framework has helped to galvanize development efforts and guide global and national development priorities. While three of the eight goals have been achieved prior to the final deadline of 2015 progress has been uneven within and across countries. Thus further efforts and a strong global partnership for development are needed to accelerate progress and reach the goals by 2015. The outcome document of the 2010 High-level Plenary Meeting of the General Assembly on the MDGs requested the Secretary-General to initiate thinking on a post-2015 development agenda and include recommendations in his annual report on efforts to accelerate MDG progress. The outcome of the Rio+20 Conference on Sustainable Development initiated an inclusive intergovernmental process to prepare a set of sustainable development goals (SDGs). There is broad agreement on the need for close linkages between the two processes to arrive at one global development agenda for the post-2015 period, with sustainable development at its centre. The Secretary-General established the UN System Task Team on the Post-2015 UN Development Agenda. Chaired by the Department of Economic and Social Affairs and the United Nations Development Programme, the team brings together the efforts of more than 60 UN agencies and international organizations. In July 2012, the Secretary-General launched his High-level Panel of Eminent Persons on Post-2015 Development Agenda to provide guidance and recommendations on the post-2015 development agenda. The panel is chaired by the President of Indonesia, Susilo Bambang Yudhoyono, President of Liberia, Ellen Johnson Sirleaf and the Prime Minister of the United Kingdom, David Cameron. Its 27 members include representatives from the private sector, academia, civil society and local authorities. The Panel has published its report in May 2013 (available in English, Bahasa and other languages). National consultations on a post-2015 development agenda are under way in more than 70 countries. The United Nations Development Group has organized a set of eleven thematic consultations, on conflict and fragility; education; environmental sustainability; governance; growth and employment; health; hunger, food and nutrition; inequalities; population dynamics; energy; and water. A report with the preliminary findings from the national and thematic consultations was launched in March 2013. A scenario where youth demands to be heard by the government might be commonplace for some people, but how about a scenario where the government actuallyinvited youth as part of a consultation process? Last Thursday, G20 Youth Indonesia took part in the National Consultation Meeting on the Post-2015 Development Agenda, organized by the Indonesian Presidential Delivery Unit (UKP4). Kania Kintani Muksin and I represented youth constituents and we voiced our ideas on the most pressing issues that should be considered in the new development agenda. This agenda, steered by a “high-level panel” consisting of the Indonesian President among others, aims to replace the UN MillenniumDevelopment Goals (MDG) which expires in 2015. Along with other passionate advocates of different causes, we collaborated with individuals from sectors as diverse as the government, civil society organizations, the private sector as well as academia. The day commenced with introductory remarks about the key points for the discussions. The recommendations had to be ‘ambitious, solid, and relevant’ compared to the current Millennium Development Goals, the opening speaker said. The concept “good governance” is not the end goal, but it is the means to achieve the bigger vision of the post-2015 development agenda. Among others, Kania and I managed to bring up the issue of energy efficiency, sustainability, and accessibility. In the short and medium-term, today’s youth will be very affected by the availability of energy. I believe that it has to be one of the government’s top priorities. In our discussion, Kania—who works in the energy sector— suggested how youth could play a bigger role by being more aware about their energy consumption and push for more energy-efficient policies. Another concern that we voiced was the case of youth refugees. Despite the progress on education and health talks, our brothers and sisters in the refugee camps (both from conflicts or natural disasters), are often still out of the picture. They might have the potential as future leaders—but lost hope because their homes and lives have been taken away from them. The post-2015 development agenda has to take extra attention to the vulnerable and marginalized groups including youth refugees. After 120 minutes of parallel discussions, each group (government, private sector, academia, civil society, and youth) was given 10 to 15 minutes to present their recommendations. I was honored to present on behalf of the youth group together with Dimas Sandya Sulistio (Indonesia Mengajar) and Iwa (Forum Anak Kalimantan Barat). We received many positive feedbacks to our ideas— some compliments were given from the floor, while some non-youth participants actually approached me to discuss several ideas. At the end of the day it was a great experience participating in this consultation process on behalf of Indonesian young leaders. 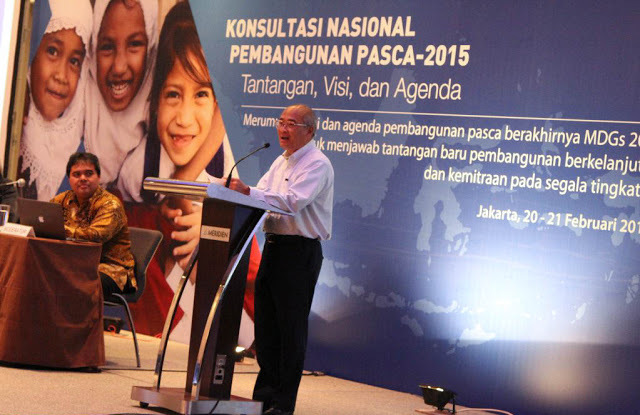 I agree with Kuntoro Mangkusubroto (Head of President's Delivery Unit), who said that the post-2015 development agenda could only be inclusive if everyone participates. You should, too. Start by downloading the document on youth recommendationshere (in Bahasa Indonesia only). Have a great day! Andhyta Firselly Utami is the Head of State for the Indonesian delegation to the 2013 Y20 Summit. Bali, March 23rd 2013 – As many as 100 young people gathered from 26 different countries and 67 of youth and children organization on 24-25 March 2013 in Bali to discuss and call for the inclusion and accommodation of interests of young people, specifically on the marginalized groups in lights with Global Partnership Scheme for Post-2015 Development Agenda. These wide range of youth representative are chosen under selective process out of total 1,500 applying candidates from all over the world, representing wide array of issues and expertise. Currently, youth are accounted as 43% of World’s total population. Therefore, inclusivity of youth are seen as highly imperative to be included in the decision-making process in respect with the Post-2015 Development Agenda. Beside, it is self-evident that any outcome that is currently being drafted by the UN High Level Panelist will significantly impact the course of life of the young people itself. Youth Multistakeholder Meeting on Post 2015 started in March 24th, 2013 and took place in Swiss-Belhotel Bay View Nusa Dua, Bali. The meeting was opened by the convener(s): Muhammad Iman Usman from Indonesian Future Leaders (IFL) and Rachel Arinii Judhistari from Asian-Pacific Resources and Research Centre for Woman (ARROW). Both of the conveners emphasized the role of the meeting in facilitating the consultation and means of getting the outcome of the consultation across to the UN High Level Panelist. These 26 people of High Level Panelist will further convene and draft a report to incorporate and cover various global consultation process towards the Post 2015 Development Agenda. In order to ensure that the process proceeds in inclusive, transparent and accessible manner, not only to those who were present during the meeting but also wider range of people who were not able to present at the meeting , the organizing committee have welcomed online participation by accessing http://post2015.indonesianfutureleaders.org. In addition, youth representatives and wider audiences are also suggested to join the online global consultation through http://worldwewant2015.org/baliyouth. Thaw Zin Aye representing Youth LEAD from Myanmar expresses his concern over the importance of access to health service for young people, especially marginalized group. Quoted” Young people from marginalized group needs to exercise their rights in termsof getting access to proper reproductive and sexual health services, including HIV and AIDS. Normally, access to those services are limited to those who are unmarried, not enough financial supports and remotely located from health care centre. Therefore it is imperative to increase access to health care for all young people without stigma and discrimination, because health is universal right. One other participant from Kenya, Willice Onyango asserted that Post 2015 Development Agenda should be able to accommodate education, jobs and livelihood and health issues. Youth Multi Stakeholder Meeting is a part of global parallel process during the UN High-Level Panel of Eminent Person on Post 2015 Development Agenda meeting. The meeting is held and organized by Indonesian Youth Working Group, under the mandate of Indonesia’s President Delivery Unit of Development Monitoring and Oversight (UKP-PPP). The Youth Working Group consists of different youth-led organizations, for instance: Indonesian Future Leaders, ARROW, Women Research Institute, Youth Coalition, G20 Youth Indonesia (now Indonesian Youth Diplomacy), and Young Leaders for Indonesia. The meeting commits to provide consultation space for various youth organization from all around the world, to brainstorm on the strategy to better include and accommodate issues that might affect young people so that they can be accounted as one most important stakeholder under the Post 2015 Development Agenda. Contact us if you have more questions regarding the Post-2015 Development Agenda!